61 cents per ounce is a rate of change. Graph the line modeled by this (y intercept is 0) and it becomes slope of the line. In referring to algebra we often hear, “when will I ever need this?” My response is “all the time!” Our job as teachers is to make this connection for students. Slope is one of the most important topics covered in high school algebra yet it is one of the least understood concepts. I have two observations about this. First, slope is often introduced with the formula and not as a rate of change. Second, students intuitively understand slope as rate of change conceptually when presented in a relevant, real life context. The challenge is compounded when slope is presented with the y-intercept. In the photo I present slope and y-intercept in a context students can understand (money is their most intuitive prior knowledge). The highlighting makes it easier for them to see the context, specifically the variables. I have the students work on this handout and I circulate and ask questions. I point out that you can find this rate or slope in the equation, the table and in the graph. 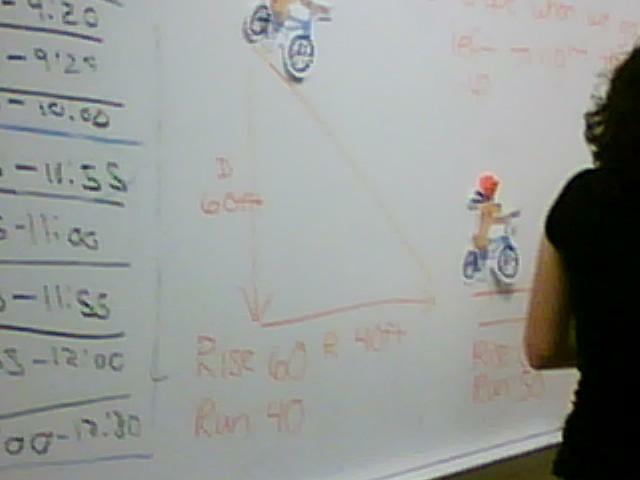 Slope may be the most challenging concept to teach in algebra yet it is one of the most important concepts. I use the following sequence to introduce slope: rate of change, rise over run, rise over run as a rate of change. 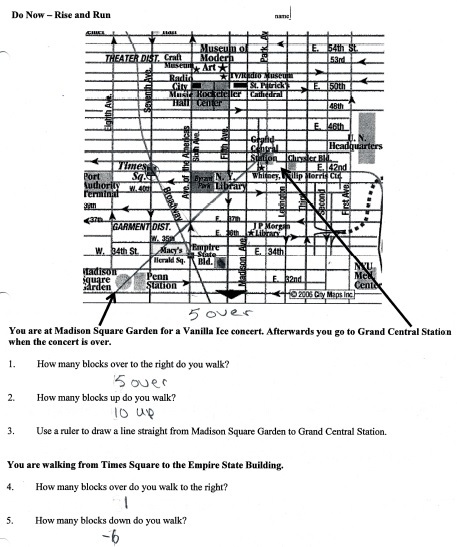 The first photo is a map of Manhattan with directions on counting city blocks. This builds on prior knowledge to introduce rise and run. The photo below builds on the map and transitions students into coordinate planes. They are introduced to rise over run and positive and negative as indicators of the direction of a line. The photo below combines rise and run with rate of change. The hourly wage is prior knowledge they can much more easily comprehend. A major issue is getting students to include units and to understand what units are. This would have been addressed in the previous unit on rates and proportions. 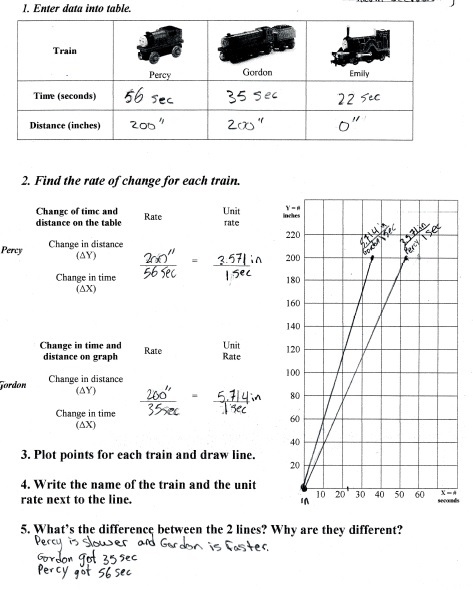 This is the handout used with a train activity in which I use battery operated trains and time them as they travel 200″. I project a stop watch on the screen as the train moves. 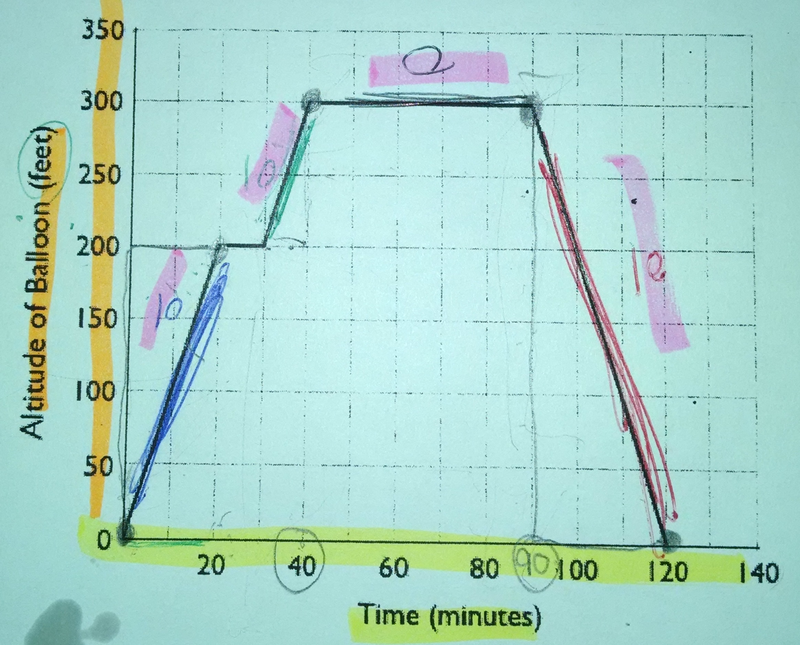 The kids pick up right away that Percy is “slow.” As Percy is traveling I ask them how they know it is slow and get answers like “it takes a long time.” This is a concrete representation which they can draw upon as they work with the graph and calculations. 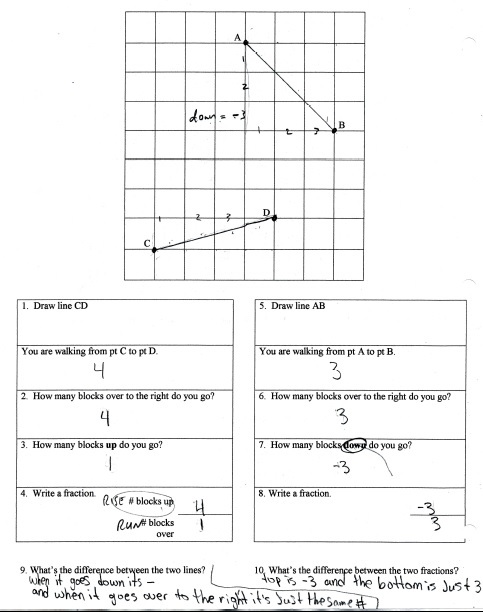 The photo below shows a scaffolded version of a Smarter Balance (Common Core assessment) test question. 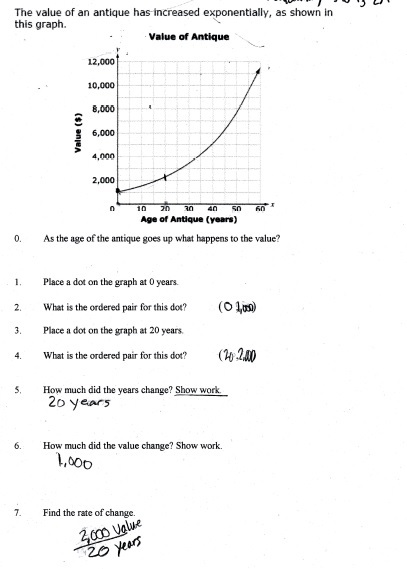 The original question simply shows the graph and asks for average rate of change from 0 to 20 years. 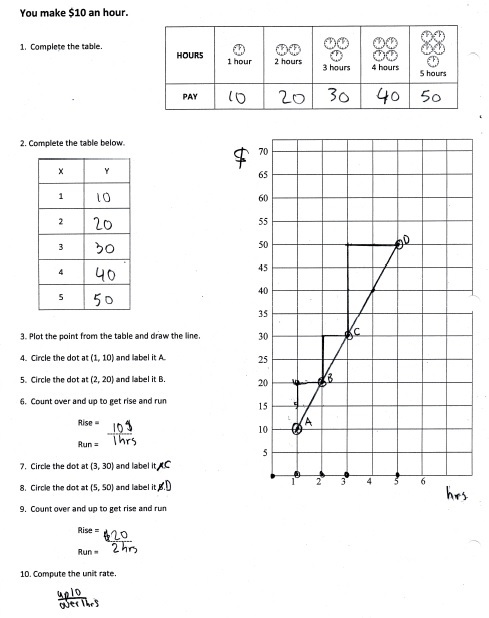 Even with the scaffolding many problem areas appear: units vs variable (student wrote “value” as opposed to $), including $ with the 1000, finding unit rate, and even identifying the part of the graph at 0 years.